» Buy Best Grass Carpet Today & Get Big Saving On It! PROMO ARTIFICIAL GRASS CARPET FOR YOUR INDOOR AND OUTDOOR INTERIOR!! CNY Promo is knocking at you!! 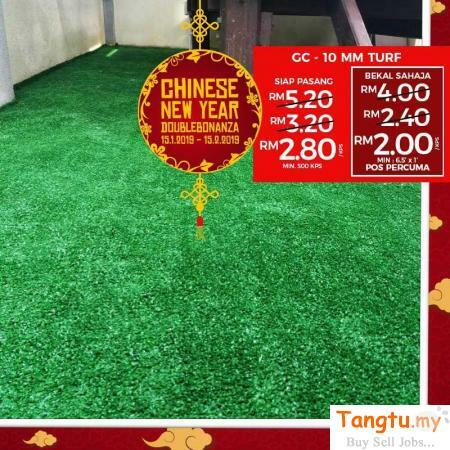 You can get Artificial Grass Carpet just from RM2/sqft!! Here are some reasons why Fake Grass carpet may be your best option. 1. Reduce your water bills and save precious water. Get a free quote and advice from Alaqsa Carpets today. We have high quality, trained installation teams in many areas near you. Our experts can help advise you on the features available from Alaqsa Carpets to make your garden fun and safe for your children, pets and all of the family.